I’ve just taken in a few shows at this year’s jazz fest, all good, but again the thought strikes me each year how these events are turning more and more into pop festivals. On the one hand, I hate having to break down music into often-arbitrary genres. That’s one of the reasons I began this site. On the other, I think the festivals’ growing dependence on acts that are clearly pop or rock is troubling. There’s less jazz at jazz festivals these days, or so it seems. I know it’s about money. In Canada, through the 1980s and ’90s, the festivals’ big sponsor was tobacco, but then the federal government clamped down on how cigarette manufacturers could market their products. The fear was this would be the end of the festival circuit in this country, but other corporate partners stepped in to fill the gap, at least partly. I don’t think the festivals have ever fully recovered though. Don’t get me wrong; I have no love for the tobacco companies and I’ve never smoked their products, even though I was a regular festival-goer in Vancouver back to the first Du Maurier festival in 1986 and was exposed to their corporate logos. I’ve also lost track of how many jazz players, all too often photographed with a cigarette propped between their fingers, died before their time. If they weren’t dropping dead from heroin overdoses in their thirties anymore, they were losing to lung cancer in their fifties. I should also point out the mix of musical styles at festivals isn’t entirely new. The festivals have included funk, R&B, roots or world music acts for a long time, but they didn’t seem to be the focus. There might have been a “groove” series for funk acts or a double-bill of African musicians. Most festival headliners though always fit comfortably into the category of jazz, which albeit is a broad term for many styles of music. If they acts weren’t jazz, most of the pop acts at least had some relatively direct links to it, or at least blues. The renowned New Orleans Jazz and Heritage Festival has provided an example of mixing musical styles, though perhaps the word “heritage” allows an escape clause to account for the many non-jazz acts. In general, jazz fests seem to be pushing jazz less and less. 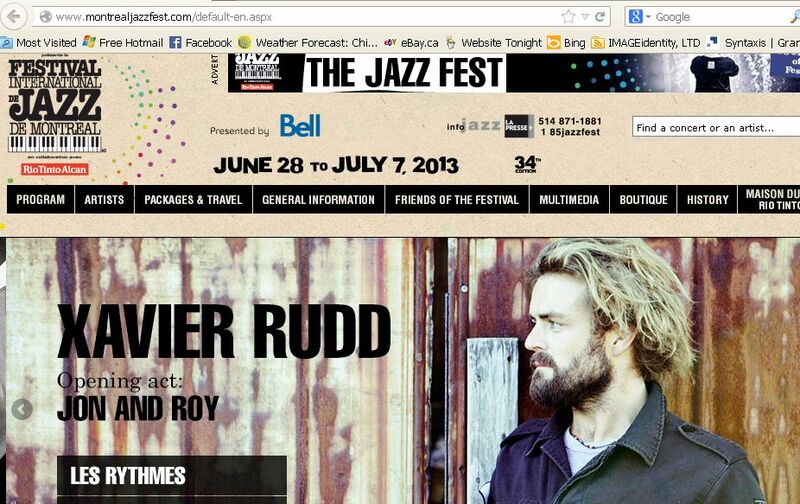 Even the venerated Montreal festival shows acts like the Specials, Xavier Rudd and Mother Mother as headliners across the banner of its website, with only a few clear-cut jazz names in the mix. I know folk festivals and blues festivals have gone the same route in recent years by offering more acts that clearly fall outside their boundaries. In a way, it’s great chance for people to get exposed to more kinds of music, but it’s also a little embarrassing, at least to me, when your headliners have little to nothing to do with the style of music that your festival claims to be celebrating. I’d hate to see these festivals turn into pale imitations of Lollapalooza, Coachella, ACL or Bonnaroo, with a smidgeon of jazz, folk or blues thrown in.